Enthralling sports drama involving a highly-touted high school basketball player attempting to get a scholarship to Georgetown. He finds himself caught between two brothers who want to look after him, a gangster and a former athlete with a tragic background. 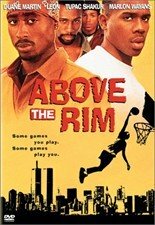 Exciting hoops footage and powerful performances from Duane Martin, Tupac Shakur, and Leon are the highlights. 98 min. Standard and Widescreen; Soundtracks: English Dolby Digital 5.1, Dolby Digital stereo; Subtitles: English; theatrical trailers; DVD-ROM content.